I intended to write up a longer blog post for these beauties, along with homage to my friend, Amanda, who introduced me to cooking Italian-inspired food. However, several nights ago I nearly sliced off the tip of my finger in a knife accident, so typing is happening via the pecking method today, which is slow and painful. At any rate, I hope you enjoy this recipe as much as our family does! Pour the tomatoes into a large pot, squishing them with your hands. (I usually add about a cup of water, from rinsing out the tomato cans.) Add the onions, cut side down, and the butter. Bring to a boil, then reduce heat and simmer for about 45 minutes to an hour. Stir occasionally. When the onions fall apart and are soft, you'll know the sauce is done. Season with salt, to taste. 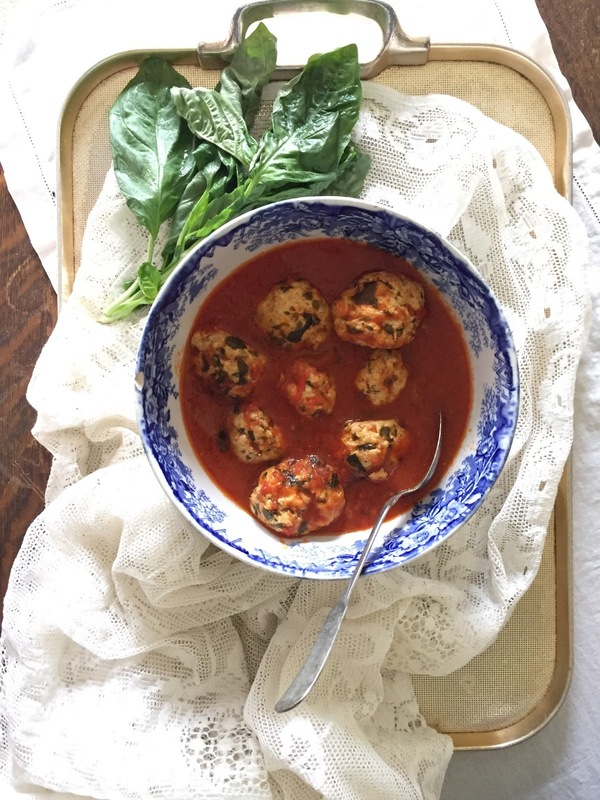 In a large bowl, combine all ingredients for the meatballs. Blend everything gently with your hands. Form into golf-ball sized meatballs and place them on the baking sheet. Spray with olive oil cooking spray or brush with olive oil. Bake them for about 25 - 30 minutes, then remove from the oven and transfer them into the pot of bubbling sauce. Let them simmer in the sauce for about 10 - 15 minutes.